Commander Defence Force, Commodore Tellis Bethel and Lieutenant Edward Fritz leading a routine inspection of one of the platoons during the Commander Defence Force Divisions on February 9, 2018 at HMBS Coral Harbour. Coral Harbour Base, 12 FEB. ‘18 (RBDF): The Commander Defence Force, Commodore Tellis Bethel, encouraged members of the Royal Bahamas Defence Force to ‘hold the line’ in his first Commander Defence Force’s Divisions held on Friday 9th February, 2018. The ceremonial Divisions provided Commodore Bethel the opportunity to inform his Officers and Marines of his intent for the year, and to address challenges and concerns of the Force with solutions to overcome them. This military tradition also allowed Commodore Bethel to thank his troops for their service and accomplishments during the past year. The timely address came on the heels of three wooden Haitian sloops landing on the southern coast of New Providence over a three-month stretch. Notwithstanding these landings the Defence Force had apprehended or assisted with the apprehensions of some 1,300 migrants last year, including the disruption of a suspected international migrant smuggling operation two months ago, which resulted in the apprehension of 14 people from five nations aboard an unsuspecting motor yacht. The Defence Force also apprehended a Haitian sloop earlier this year. In the weeks leading up to the parade, Commodore Bethel met with Defence Force Officers and Marines at all levels highlighting the short and long term solutions for the challenges that lie ahead. During his Friday address, Commodore Bethel encouraged his troops to remain focused, and not to allow themselves to be distracted from the task at hand while they ‘hold the line’ in performing their duties. During the sectioned meetings prior to his Divisions, Commodore Bethel reminded members that the Defence Force was at a critical stage of transition where it recently entered a new era of modernization to resolve problems of inadequate bases, port facilities, maritime assets (including ships and aircraft) and personnel, while simultaneously dealing with the constantly changing tactics of poachers, as well as migrant and drug smugglers. As a result, the Defence Force is unfolding plans for the expansion and construction of bases in Inagua and Ragged Island, respectively, to sustain long term deployments of its ships and aircraft to provide immediate response to poaching, as well as illicit smuggling activities originating in the Southern Bahamas. Though limited in capacity, the Defence Force has already began reconnaissance flight operations out of the southern Bahamas. Other short term goals shared by Commodore Bethel included the Prime Minister’s, Dr. the Honourable Hubert Minnis. and the Minister of National Security’s, the Honourable Marvin Dames intent for the Defence Force to develop and coordinate a national multi-law enforcement agency drone program, as well as a national multi-law enforcement agency Coastal Security program to address the problem of changing modes of operations by those engaged in criminal activities on and offshore. High on the list of priorities is the accelerated recruitment of personnel as an initial human capital audit has revealed that the Defence Force is currently operating at a shortfall of over 500 persons, thus highlighting the added responsibilities borne by each member of the Force. In January of this year, 120 persons had commenced recruit training. The Defence Force is also moving forward with plans to enhance its communications, detection, tracking and interdiction capabilities. Initial work has commenced on the installation of a coastal radar system. Additionally, plans are already underway for the acquisition of an island-wide ‘Motorbro’ radio communication system, along with an Automated Identification System for identifying vessels in Bahamian waters. These programs are being funded by the US State Department under its Foreign Military Sales program. While expressing concern for the recent landing of a Haitian sloop for which a Board of Inquiry will be convened to investigate, Commodore Bethel applauded his men and women for the successes they did achieve in exercising their powers as Peace Officers, Customs Officers, Immigration Officers, Fisheries Inspectors, Port Security Officers, National Emergency Managers and much more. Earlier this year, the Defence Force divers had assisted with recovery of remains of Bahamian occupants of an aircraft that had crashed in waters off North Andros. More recently, the Defence Force has provided support for Police operations on the streets of New Providence with significant success. In addition to capturing a go fast vessel with an estimated one and a half million dollars’ worth of marijuana, last year made the third consecutive year that the Defence Force deployed troops, ships and its Containerized Mobile Base to bring disaster relief assistance to thousands of Bahamians combined in New Providence and the Family Islands during Hurricanes Joaquin, Matthew and Irma. The Defence Force also provided relief assistance to the Commonwealth of Dominica on behalf of the Governments of The Bahamas and Jamaica. 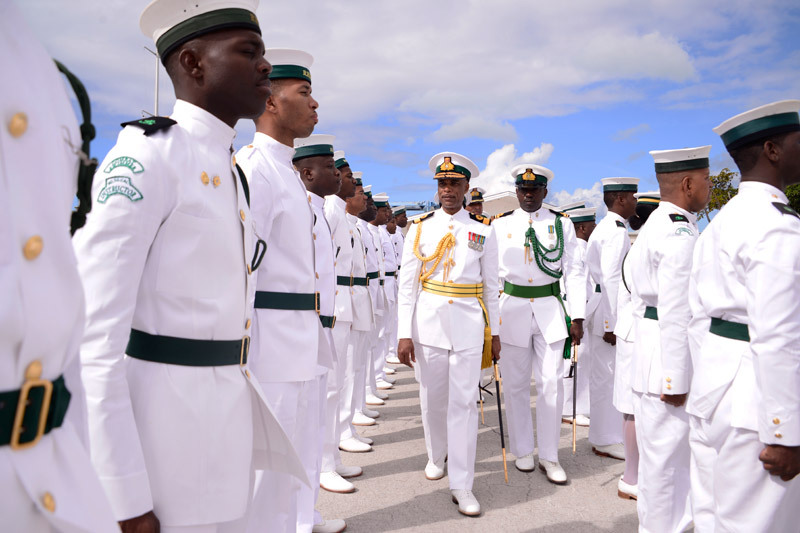 In thanking the men and women for their dedicated service and encouraging them to hold the line, Commodore Bethel also informed them of specific goals that would be achieved to improve their conditions of service at all levels.